The world's oldest surviving Vauxhall is coming up for auction next month. Auction firm Bonhams will be putting the vintage Vauxhall under the hammer on November 2 as part of a special sale dedicated to veteran cars and automobilia. 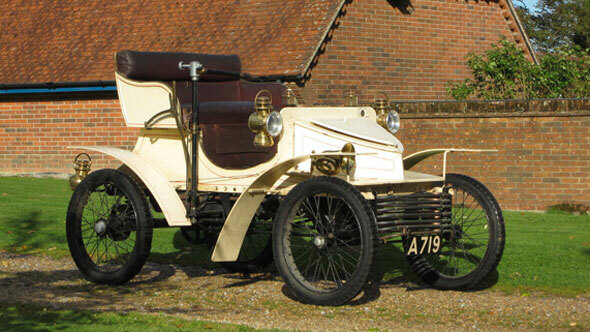 The 1903 Vauxhall 5hp Two-seater Light Car will arguably be the centre of attention at the auction, being described by Bonhams as "truly remarkable and represents a landmark car in the history of one of England's premier motor car manufacturers". It's believed to be the oldest known surviving Vauxhall in the world, and is expected to fetch between £60,000 and £80,000. The sale will also mark the first time the car has been offered for sale on the market in its 108-year history. The car was ordered new on November 6, 1903, by the then Vauxhall managing director Percy Kidner. He ordered it at a "director's price" in cream with red upholstery and a pair of sidelamps. Original files and artefacts come with the car as well. The auction will also see the sale of a 1904 Wilson-Pilcher 12/16hp Four-Cylinder Four-seat Phaeton, as recently reported on Autoblog. The car is thought to be the sole surviving example of its type, and has been owned by its creator's family since it was built more than a century ago. Both cars are eligible for this year's veteran London to Brighton rally.